Sometimes it’s hard to come up with stitched gifts for the boys and men in our lives. I’ve recently found some ideas that would be suitable for most males, maybe even some of the females, in your life! This isn’t new, and I’m not sure where I originally saw it, but doing a quick and simple zodiac symbol or constellation chart would provide a nice top for a box or a piece of art. 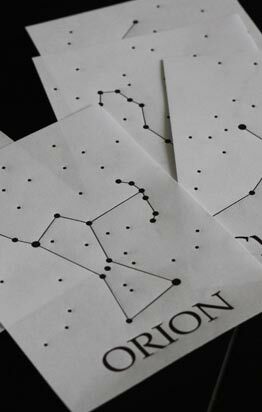 On Design Sponge, Jessica Marquez of Miniature Rhino, shares a constellation map as a table runner. She uses sequins for the stars. For a simpler version, you can find an image of a nice collection of small framed constellations on the Oh Crafts website. The creator, Diana, uses French knots for the stars. Unfortunately, the link to the complete project is now private. Luckily, you can find some patterns on the Mrs. Home Economist website. 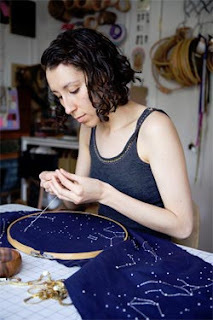 Just scroll down to the "Constellation Lacing Card" link (in yellow), to download patterns. The Martha Stewart website has patterns for all of the zodiac symbols available in a project for a lighted piece of wall art. If you're looking for something more complicated sophisticated, you download and translate a whole hemisphere from the Constellation Guide website. The links to a wide variety of maps are at the top of the page, above the name of the site when viewed on Chrome, my web browser. If you click on the map of the northern hemisphere from this page, it opens in a new window and you can click on it a second time to enlarge even more. For a more terrestrial, 3D project, Needlework Traditions offers a free pattern for a globe. Another option is to stitch a planet, or a series. You can find the patterns on sale at Navid Baraty’s Etsy site. Other planetary patterns are also available on Etsy. Maybe molecules are more his speed? Check the patterns by Pamela Buchan. Make your own pattern for a special molecule - the MolView website (note that there is a popup window asking you to subscribe/let the site see your user data; I clicked "no" and "continue" and was able to access the site without problems) lets you enter any molecule name to see a model. You can right click and save the images. Do you have any ideas to share? If so, add them as a comment below! EAC at the NS Fibre Arts Festival – Awesome! The EAC Program Resource is for YOU! 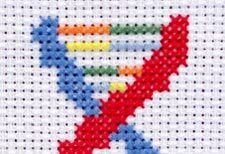 New EAC Online Correspondence Course!